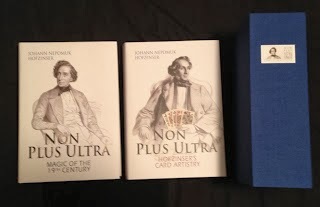 The books are called Johann Nepomuk Hofzinser Non Plus Ultra, Volumes 1 & 2. Volume 1 is subtitled Magic of the 19th Century. Volume 2 is subtitled Hofzinser's Card Artistry. They have been written, researched and compiled by Magic Christian. Volume 1 originally was published in German in 1998. The second Volume followed in German in 2004. They were translated into English in 2013 and these are the books I proudly own and am carefully reviewing. Non Plus Ultra. Interesting title for a book. It's Latin meaning Nothing Further Beyond, in other words, the Ultimate. I'd say, it's a fitting titled for these three books. What? Yes, I said three. There are 3 Volumes of Non Plus Ultra. The third was published in German in 2012 and covers all the apparatus and non card magic of Hofzinser. It is listed as 'forthcoming' so the English translation is being worked on and we will one day get to enjoy even more of Hofzinser's magic. For now, there is much to learn about Hofzinser. Apparently, much of what has been written about the man biographically in the past was incorrect. Magic Christian has painstakingly set the record straight by correct every detail possible. 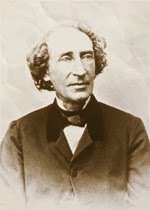 Right off the bat, we find the correct date for Hofzinser's birth June 19, 1806. Then we begin to learn of the rather larger Hofzinser family. It turns out that one of the siblings, Franz-Xaver Fidelis, was so famous in Austria that he is still recognized today in books on the most famous Austrians. His claim to fame was writing a very influential set of books on Light and Heavy Cavalry for the Military that had a profound effect on how horses were treated during military service. There were several other siblings but they did not have note worthy lives. One thing that does seem to remain true from previous histories of Hofzinser is his relationship to Ludwig Doebler. It is assumed they were cousins and more than likely Doebler was the inspiration for Hofzinser's interest in magic. 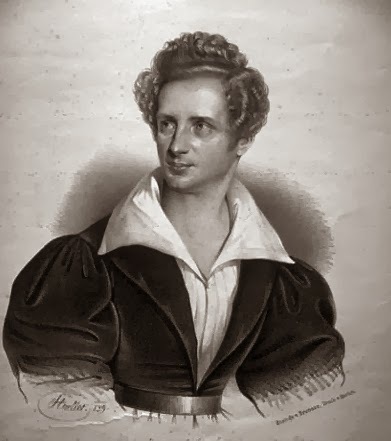 Born in 1801 in Vienna, he was a few years older than Johann. Doebler was certainly a magic celebrity in his day. He even finds his way into many magic history books, where Hofzinser is often sadly neglected. Doebler was an apparatus magician, as were many of his time. He also used the occasional automaton. The opening of his show was breathtaking, as he walked out and fired a pistol, instantly lighting 200+ candles. Another of his famous effects was producing hundreds of flower bouquets from an empty hat. One particular routine that intrigued me by Doebler was making borrowed objects vanish and reappear tied to the roots of plants and flowers. This very effect can be found in the beloved Tarbell Course, though it is attributed to someone who was born many years after Doebler had passed away. One other interesting note about Doebler that I found. One site claims he was referred to as The Father of Moving Pictures because of his unique use of multiple still images that would turn off and on to create the appearance of movement. THIS is something I'll need to look into for another article. No doubt, the magic that Doebler performed was enough to spark the interest in his young cousin, Johann. Volume 1 clearly states that the very early years of Hofzinser's life are unknown or as yet uncovered. But they do an incredible job of tracing his life once he get's into school and then into job as a civil servant in the Viennese Government. Job records still exist on Hofzinser's work life right up until his retirement and Magic Christian did an amazing job to uncover them. But I wish to skip this section and get to the meat of things, The Salons. The first revelation you'll find is that Magic Christian has uncovered information showing the Hofzinser was not the first magician in Vienna to open a magic salon. There were two prominent magi who beat him to it and you must read the book to find out who they were. It was interesting to read that the whole idea of the Salon was used by many more artists and entertainers than just magicians and was in fact, an important place for prominent individuals to attend and to be seen. One of the first things we see in regards to the Hofzinser Salon shows was that his wife performed in the show as well. Johann presented card miracles while she presented clairvoyant demonstrations. The papers of the time noted how advanced their magic seemed as compared to those who used mechanical devices. But remember, the mechanical automaton and gimmicked apparatus were signature routines from this time period. So the Hofzinser's were offering something very different in the eyes of the public. His early show had the title of "An Evening of Deception". A rather ordinary name for today, but as Magic Christian points out, Hofzinser was the first to use it. And he kept this name for his show as he later left the Salon performances and took his show in the road, after his retirement from his government job. The book goes into great detail about his travels and follows with many reprints of newspaper articles. Most of the reviews are kind and generous but one in particular stood out at me. The review though complimentary at first changed it's tune due to the high admission price charged and then further went to calculate the amount the Hofzinser made at a performance and how this price was far more than a conjurer should be making. And again, as Magic Christian points out, the same sort of mind set can still be found today. Volume 1 covers Hofzinser's entire life, his death, burial and then his students, his letter and his contemporaries. It is so comprehensive, I can't help but wish that every biography of a magician was so thorough. Getting into Volume 2 however is just a mind bending affair. Whereas Volume 1 was history and mostly newly uncovered history of Hofzinser. Volume 2 gets into his card magic. I'm not even sure I can describe it and do it justice. One of the first things I turned to when I was first just browsing through the volume was a section on what we know of today as the Electric Deck. It is a site gag used by poor performers basically and generally used for a cheap laugh. Or so I thought. Hofzinser's use of the Electric Deck is a huge wake up call to the modern magician. Here, Hofzinser shows how by switching a real Deck for an Electric Deck, one can create some highly incredible flourishes that all appear to happen with an ordinary pack of cards. OMG, it's BRILLIANT! But there's more. Imagine my own surprise, shock even, to learn that one of Hofzinser's prized possessions resides only 25 miles from me. It's Hofzinser's Card Box, and again, if you think you know the Card Box, well, it's time you got reeducated like I did. The Hofzinser Card Box is made of metal, and it's round and it's INCREDIBLE! Oh, and it resides at the Library of Congress in Washington D.C.. So I'll be making an appointment fairly soon to go check it out for myself. The shear amount of card material in this Volume is just mind blowing. Magic Christian again, goes to great lengths to clarify the proper handling of card moves, the history of these routines, the back story, he covers it all. Magic Christian also has no problem with setting the record straight when it comes to what Hofzinser created and what he has been credited with creating but wasn't his. For example, Johann has been credited with discovering or inventing the Rough and Smooth Principle for cards. But Magic Christian shows how this technique existed before Hofzinser and even goes to show how he was mis-credited in the first place. I must point out another effect that is in Volume 2 and that is the Card Star. I had heard that Hofzinser created the Card Star but as I read the description, I realized that his Card Star was very different from what I called a Card Star. His, was a metal star with points on the ends to which cards could be attached. Then a pointer was placed in the center of the star and spun and it would land upon the correctly chosen card. The reason I point it out is that I am adding a Spirit Dial to one of my shows. I've used it many times in the past and out of no where came up with what I thought would be a great final sequence to the routine. My idea was to add playing cards to the edges of the glass and spin the dial to have it land on a previously chosen card........YES, my idea was almost identical to the routine described in the book! In no way do I claim to have the mind or even the mindset of Johann Hofzinser, but it was a nice coincidence. Hofzinser's Card Star was more like the Spirit Dial in methodology. The 'other' Card Star was a five pointed star mounted on a pedestal. Five cards are chosen and returned to the deck and the deck is then 'sprung' towards the Card Star and the five selections appear on the points of the star. This apparently was not a creation of Hofzinser. The only thing I can add is the magic world owes a huge debt of gratitude to Magic Christian for these remarkable books! Thank you!!!!! Joe, NO! I missed it. Where is it???? In the credits. I helped update the indexes for both books.